I have just returned from paradise (very reluctantly) and look back on a very productive and peaceful week in my favourite place. I flew into East Londen and my dear friends Larisse and Athol was so kind to give me a lift up to Hogsback. It was truly a step back in time as we wound our way up the pass (now fully tarred), as next to the road were tons and tons of excusite lilies, just like the first time I accidently wandered up into this magic little kingdom. I realised then that Hogsback gives you snippets of beauty, depending on when you choose to visit. I have also never seen the bush roses in full bloom till now. Lovely! We were joined for the weekend by Phillip and Sarah from Port Elizabeth and they treated is to a lovely homecooked meal and animated arguments about the exciting political flavours currently wafting around our little country. It blended well with our food. On Sunday we frequented the cosy little chapel were I found harmony and love and a welcome cup of tea and eats at the end of it. Margeret entertained us with her cow stories while we sipped our tea and giggled. My first two days were spend in front of the fireplace, with thick mist providing a cosy cover, while I slaved away at trying to complete as many learning objects for my project as I possibly can. I also tried to keep up to speed with my online blogging workshop, and sudenly realised that I have to stop running, stop running, focus and settle down to peacefulness and one thing at a time! I thought that as I do not have wheels I would be isolated and lonely (good conditions for stirring me on to more work), but alas, this friendly little village and its people will never allow that! I was dragged out almost every night for a meal and even ventured to cook up a dinner party for my neughbours, whom I abuse from time to time! 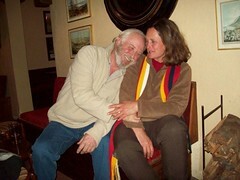 Thank you to Sonia and Tim, Carol, Ticia, the Vices and the Walkers for keeping me entertained and balanced! I also have to say that I am very pleasantly amoured with our new evening restaurant at the Enchanted treehouse. 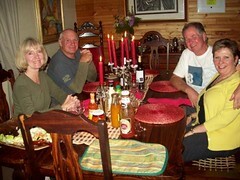 I had fillet medalians, a stunning salad and good company all around me and welcome our new reatauranteurs to Hogsback. May you go from strenght to strenght! So sadly I had to return back to the hussle and bussle of Johannesburg. I caught the backpackers little bus and low and behold, made it safely back to the airport. The on-bus entertainment in the form of two young english volunteers was amusing which made the road short and I got to the airport with time tom spare, contrasting sharply with my normal scramble not to miss my plane! As always, I come away from Hogsback with new resolve (for my projects and for my life) and a sense of what is important. I will be back, shortly, in time for the christmas flowers…..